Canada Post announced the subjects of stamps that are going to be released in 2019. On 14th January 2018, new definitive stamps featuring Queen Elizabeth II and a set in the "From Far and Wide" series will be released. 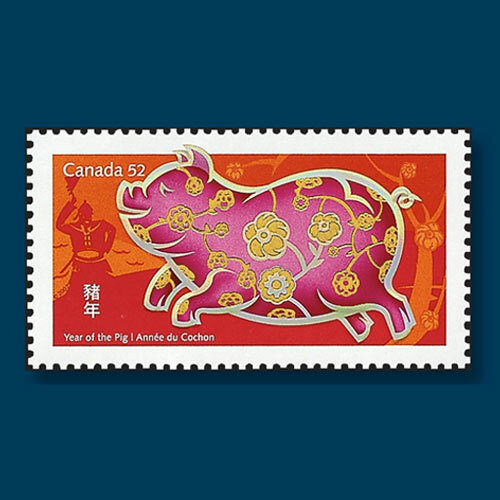 The Year of Pig Stamp will be released on 18th January. A stamp or stamps honouring Albert Jackson, the first black Canadian letter carrier, will be released in February 2019. It will be a part of "Black History series" that was introduced in 2009. Jackson was born into slavery in Delaware during the late 1850s and escaped with his mother and six siblings from the United States to Canada via the Underground Railroad when he was a young child. He worked for the post office in Toronto since 1882 for 36 years until he died in 1918. Stamps featuring gardenias will also be released in February 2019. It’s a part of the Flower series. Another stamp commemorating Vancouver Asahi baseball team will also be released in the same month. The team was formed in 1914 and was disqualified in 1942 when its Japanese-Canadian members were interned by Canada in World War II. Another commemorative stamp honouring the Red River Resistance of 1869-70 and the founding of Manitoba will also be released in 2019. Other stamps will feature Bears, endangered turtles, historic covered bridges and desserts. Community Foundation semipostals will be issued by the end of 2019 along with sacred and secular stamps celebrating Christmas. There is a possibility that the program might be revised.